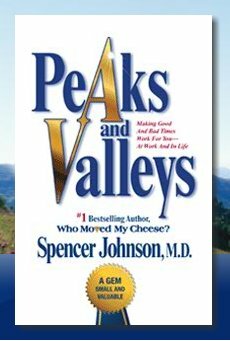 Managed to get to MPH at Mid Valley today ..
And one book made me standing still for about one hour and half.. ahahhahaa..
“Peaks and Valleys” from Spencer Johnson..
as per his previous book “Who Moved My Cheese”.. this one also being as story telling type..
this it talk about the Peaks and Valleys of a young man.. who manage to become a manager at his young age..
and to make it interesting.. he live in a valley.. something like “Klang Valley” I suppose..
then everyday he is somehow seeing a place to be called as Peaks.. like what “Genting Highland” .. can be seen from “Klang valley” from a far..
..and he think .. thing at “Peaks” must be better that what he has in the “Valley” .. hmm..
he keep postponing and dragged himself not to climb to the peak .. and reason of bla..bla.bla..
“so difficult to get to peak.” and such thing..
until that one day .. he escaped from the valley managed to get himself up to the peak.. but not fast enough.. and missed the sunset view from the peak..
“I missed it..” he said.. and suddenly an old man replied.. “Missed what?”.. and he end up explaining the reason why he is coming to the peak .. and all..
and the advice began.. on “Peaks and Valleys” as personal experience.. While we are at the valleys .. the thing that we do correct could made us to peak the next time..
but .. while we are at peaks.. the thing that we do ‘incorrectly’ would lead us to another valley..
.. and this one I agree.. we actually asked for what to happen next.. it is the matter we realized or not..
we are the one .. who make the bad thing looking so “bad” become worst.. or the good thing look too “good ” until unable to see the real situation and making mistake that could lead to another ‘valley’..
What is the truth in the situation? and.. the second round. the author talk about the ability to use the “sensible vision” to get to next peak.. knowing that you have to go to another valley..
.. also the matter of having eyes wide open of the reality rather than being arrogant at peak.. and being fear to leave the ‘comfort’ zone during valleys. “Peaks” and “Valleys” doesn’t have a clear cut or boundary..
it could be both.. depend on how you see it..
she will ended up going around the bookstore looking for ‘her’ book and all.. leaving you at some corner..and thing went back as normal as the time goes by.. hahahahahaha.. (not buying any book though).. but it could be better if could avoid the ‘fight’ at the first place..